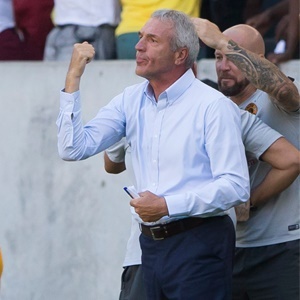 Cape Town - Kaizer Chiefs coach Ernst Middendorp says he switched from a back three to a back four in Sunday's Nedbank Cup quarter-final win over Cape Town City to add defensive stability. Chiefs were dominant and leading 1-0 in the encounter when Middendorp switched his formation to a back four in the second stanza. Amakhosi eventually ran out 2-0 winners. The German explained that the club did this to avoid City attacking down the flanks. In addition, the 60-year-old said it would assist the Glamour Boys in counter-attacking. Speaking to SuperSport, he said: "We organised ourselves quite well I think. I know even if it is unusual to make a change at half-time when you are leading. But it was necessary. “We were a little bit exposed with three at the back on the wide left and wide right. “They didn't exploit that in the first-half, but I was one hundred percent aware they would in the second-half. “When we went to a back four, we looked much more solid and could counteract their long balls. "I think in the first half and the second half we wasted some opportunities. Some four against two, four against three moments. We could have probably made it a little bit easier earlier. "I want to compliment everyone who has been involved in this journey so far, preparing the game, executing the game and now things are quite clear going in to the next game." Chiefs are set to face Chippa United in the semi-final of the competition while National First Division outfit TS Galaxy take on Golden Arrows.